Do the paints I choose make a difference? Absolutely! As I begin this discussion I want to clarify that all comparisons on this page are being made with high quality watercolor paints. To clarify or to be precise; in this section I am demonstrating such brands as American Journey, Grumbacher, Holbein, Maimeri, Winsor & Newton, Sennelier and Stephen Quiller. This is not to imply that all other brands are inferior. These just happen to be the colors I use most often in my studio. You should gather your own colors and arrange them in some orderly sense that works for you. The objective will be to compare several qualities in your chosen paints. If you wish to work with glazes you will need transparent colors. How can you tell which ones are more transparent? Two choices come to mind immediately. The first one is to study the chemistry of watercolor paint ingredients. You can make it as involved as you like. Most major paint manufacturers have web-sites and they will tell you a lot about the basic ingredients in their paint. This will help you become aware of some of the most often used ingredients. There are a number of guides that have been written that will offer their opinion regarding various colors. All of this is good. You should care enough to learn as much as possible about the materials you use. The second alternative is to experiment with the colors. In reality you should combine both approaches. After all experimentation is wonderful but you do need some structure as you conduct your investigations otherwise how will you make use of what you learn? To get started make use of waterproof black india ink. You want waterproof ink and you want to let it dry thoroughly before you begin to pull watercolor washes across it. You can paint a straight line or you can do circles, triangles what ever makes you happy. I use circles because they work better on a book page. Ok. Your ink is dry. Now it is time to apply your washes. As you look at the two charts below you will see that some colors disappear as they cross the black surface. Others do not. The ones that disappear more fully are the most transparent colors. Now if you labeled your colors then you know which ones will work best for you in the first washes you apply to produce a glaze. As you experiment with your colors you will learn several things. For example some washes will become more transparent as you dilute the strength of the wash. You do this by simply adding more water to the paint. The first chart is an excerpt from my book Mastering Glazing Techniques in Watercolor, Volume I which is a revised edition of the original publication. It is available at various outlets but you can order direct at createspace.com/36567628 or Amazon.com. By the way, the colors are labeled in the book but the copy is too small for this illustration. The second chart will be in Volume II. Chart I contains what I call more traditional colors. Colors like some cadmium colors and ultramarine. Do note that many of these colors are no longer made with traditional substances. That is, modern chemistry has found ways to produce similar effects with either less toxic or often less expensive components. Several years ago the rule of thumb was that the traditional names were retained in order to inform the experienced artist that the paint was made to perform much like its original counterpart. 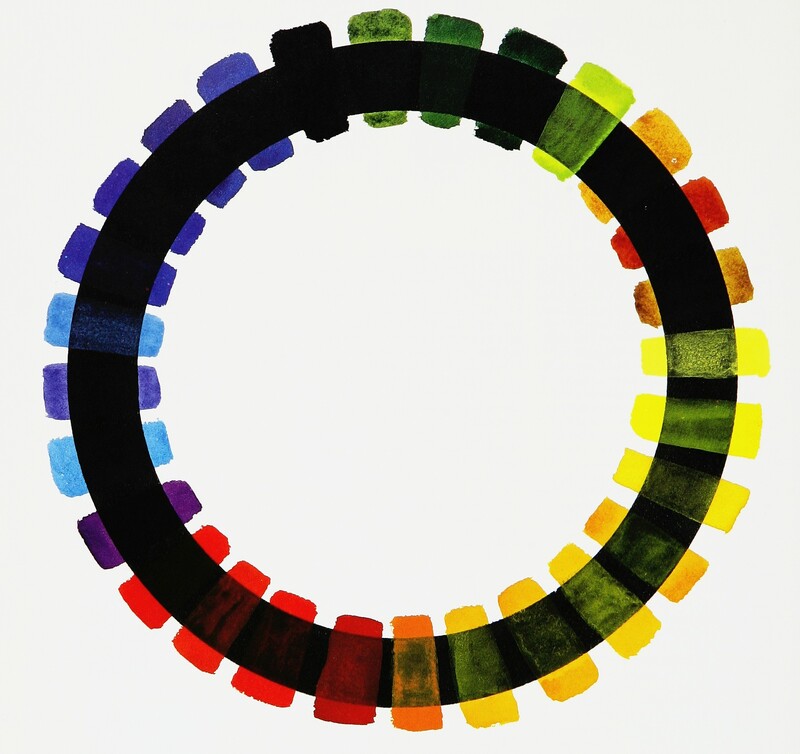 Chart II is primarily made up of Quinacridone colors that I have mentioned in earlier posts. 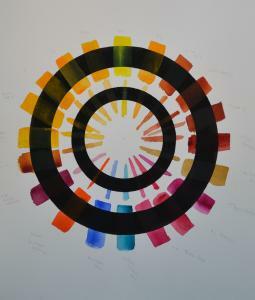 A careful examination will reveal that the colors on Chart II are more transparent than some of the more traditional colors. You will note that the outer ring has washes that are applied pretty much full strength while the inner ring has received diluted washes. If you go back to an earlier post you can see some of the difference in the quality of paint between the piece entitled Dragging Canoe and Young Warrior. Young Warrior was painted primarily with quinacridone colors while Dragging Canoe was painted with colors found on Chart I. Posted on July 8, 2012, in Uncategorized and tagged American Journey, Grumbacher, Holbein, Maimeri, Quinacridone colors, Sennelier, staining pigments, Stephen Quiller, traditional watercolors, transparent watercolor test, Winsor & Newton. Bookmark the permalink. 1 Comment.